My new kick these days is combining the drab with the elegant to bring out a new kind of beauty. It’s somewhat steampunk, but not as mechanical. You could call it “District 13 Comeback” style. This neck wrap is a perfect example of what I’m talking about. It’s silk wrapped with dirty gauze, strung together with velvet laces. I could see Katniss Everdeen wearing this to dress up her leather hunting clothes. My favorite thing about this neck wrap is that it’s easy to make. You simply fold a piece of gauze over a strip of silk (seven inches by forty five inches) and sew two strips of ribbon over the gause to form tubes through which you thread two lengths of cord (sixty inches folded in half). 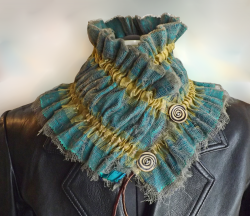 The neck wrap is gathered to fit around the neck, and two buttons are sewn to one end of the wrap so secure it in place. That’s it! You can watch me make it in this video.